Home » Crafts and DIY » DIY Desk Organization Idea that is Creative and Inexpensive! This DIY desk organization idea has been sponsored by Westcott Brand and Role Mommy but all opinions expressed here are my own. Do you have any idea how many times I have heard the phrase ‘I can’t find a pen’ in my house? Seriously. Where do they all GO? Well, I am hoping that this DIY desk organization idea will help my family keep pens, pencils, and glue sticks front and center from now on. What I really love about this desk organizer is that it is easy to make and incredibly inexpensive. And, of course, it finds a great new use for cans that would otherwise just get tossed into the recycle bin! So, I have a love/hate relationship with my glue gun. It’s old and I’m not a particularly skilled crafter. When Westcott Brand sent me their new mini hot glue gun, I was curious to see how it compared to the ancient one I have had for 10 years. Let me just say that I am impressed! 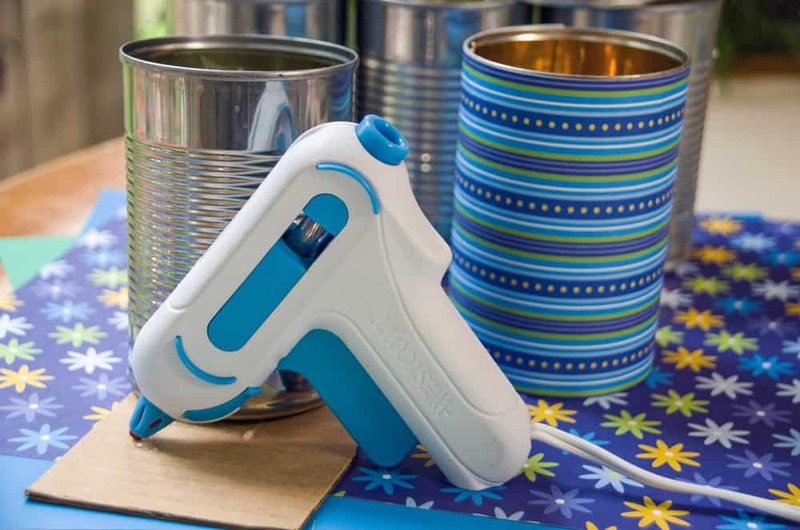 You can get the traditional glue gun or their new glue pen, depending on the style you prefer. I love that the tip goes from blue to red to indicate that it’s ready to use. And even better, there is ZERO leaking of glue from the tip until you press the plunger. My old glue gun leaks out glue even when I am not using it! 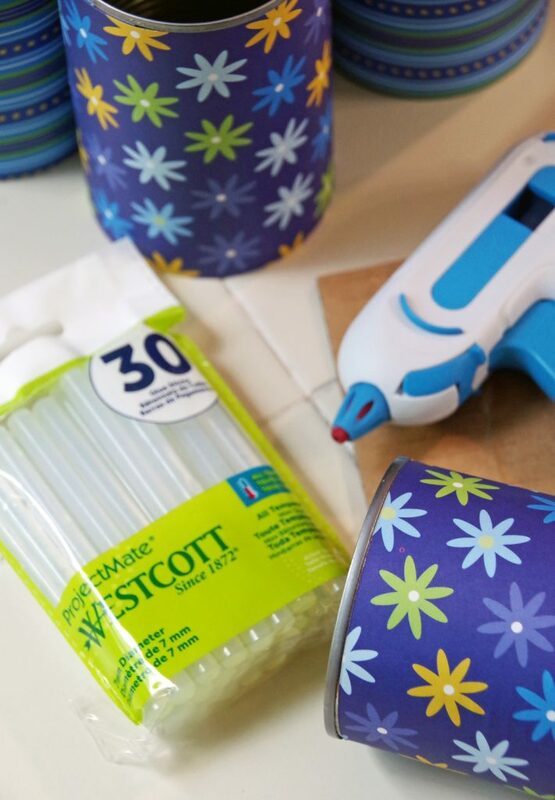 I am definitely a fan of Westcott Brand and will be using this glue gun for years to come! 6 empty tin cans, washed with labels removed. Making this desk organizer is simple. Just wash and dry the tin cans and remove the labels. Don’t worry about getting them totally removed. You are just going to glue scrapbook paper to the outside anyhow. Measure the scrapbook paper before cutting it. Just set the can on the paper and make a mark with a pencil so you know how wide to cut the paper. 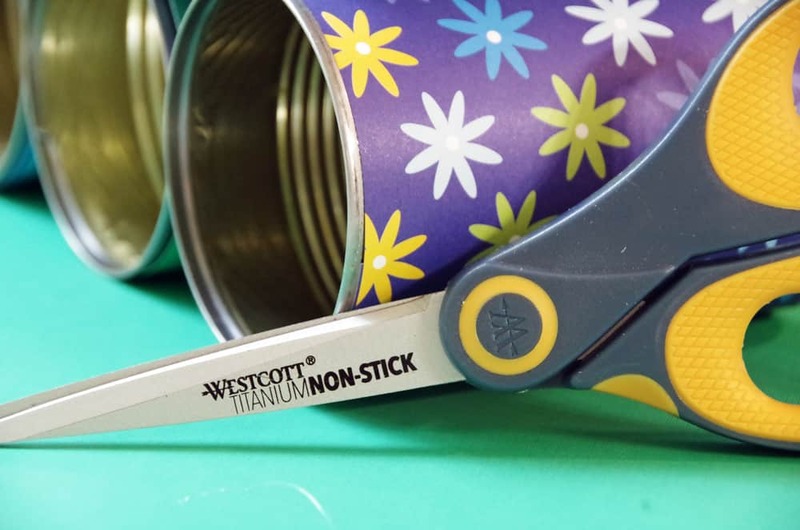 Using either scissors or a paper trimmer, cut the paper to the width you need it. I chose several patterns and solid colors in the same general color scheme. Choose any color or theme that inspires you and matches your decor. Next, just glue the paper onto the can. I glued the first edge of the paper, rolled the can, and then glued the end shut. It won’t be handled a ton so a light gluing is all you need to keep the paper in place. Once you have all 6 cans wrapped in paper, just glue them all into a pyramid shape. 3 cans on the bottom, 2 in the middle, and one can on top. 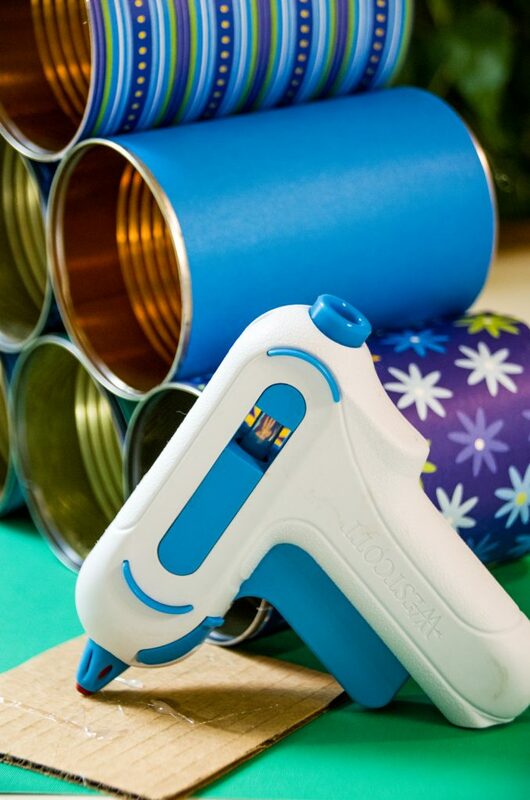 Hold the cans together for a few seconds after you add the glue to give it time to harden and set the cans in place. 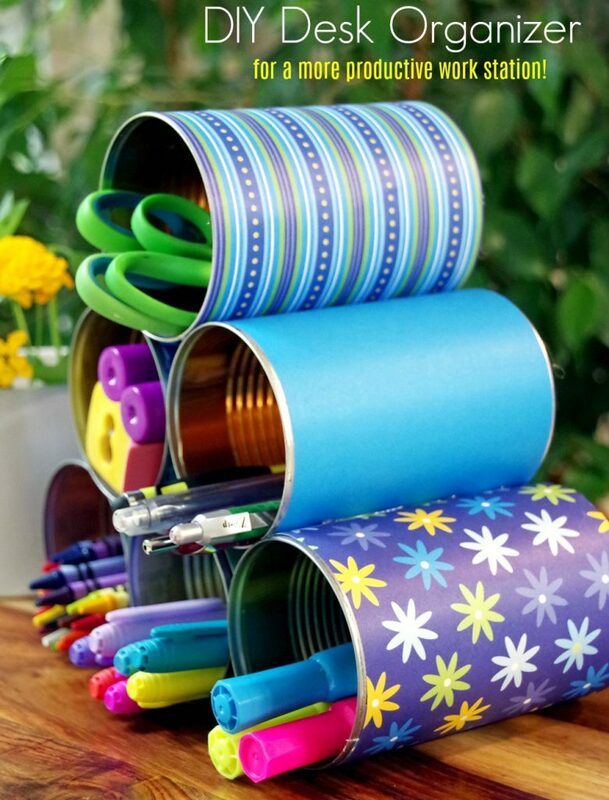 Once you have all the cans glued together, all you need to do is add your school or office supplies to it and you are done. If you have small kids, you can put in glue sticks and crayons. Even without kids, this DIY desk organization idea is still incredibly useful. 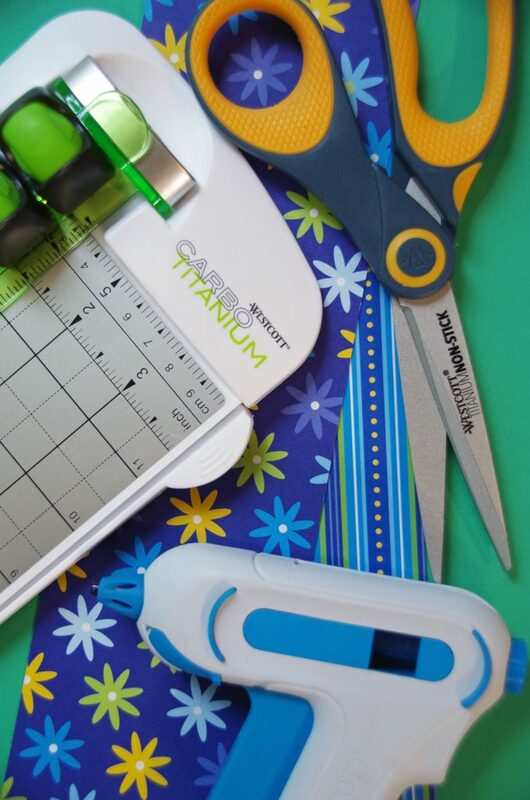 It’s a great place for pens, stamps, and other office supplies you may need on a regular basis. Do you know how often I have to hunt for a permanent marker to label a jar or container? Quite a bit! And now I will never have to go digging through a drawer for them! Even if you do not consider yourself a crafty person, you can make this DIY desk organizer. I am seriously craft challenged. This project was quick and easy and it’s a great way to reuse something that would otherwise get thrown away or recycled. If you want the full details of the project in video format, check out the quick video below! Want more creative craft ideas? 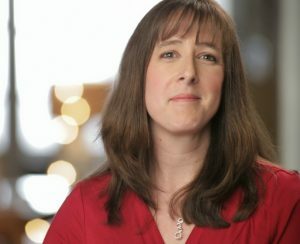 You’ll find additional craft ideas at WestcottCreativators.com. 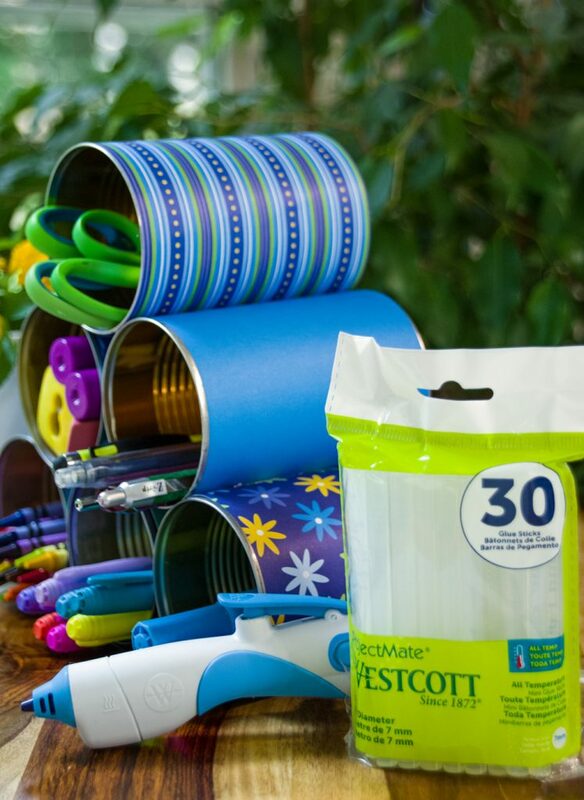 You can also follow Westcott Brand on Facebook or Twitter to get more crafty inspiration! Learn how to stay organized and you will seriously reduce the amount of stress in your life! Like this DIY desk organization idea? Pin it for later! 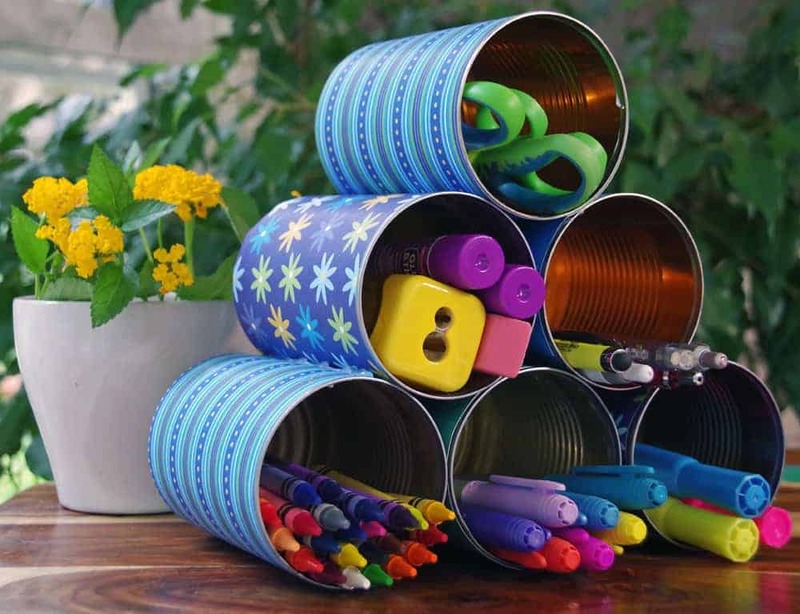 I love projects that use recycled items like tin cans. I like how the scrapbooking paper lets you customize the decor so it looks great in any room. My kids would probably like to make one for their own desks. You made those cans look GOOD! I need help with my desk and this would be an inexpensive project to try! I love a good upcycled craft project! This desk organizer is adorable, and I love how it can be customized with whatever scrapbook paper you wish to use. Thanks for the tutorial! This is such an awesome idea! I use canned goods all the time, anyway, and I have a ton of Washi tape. Boom!